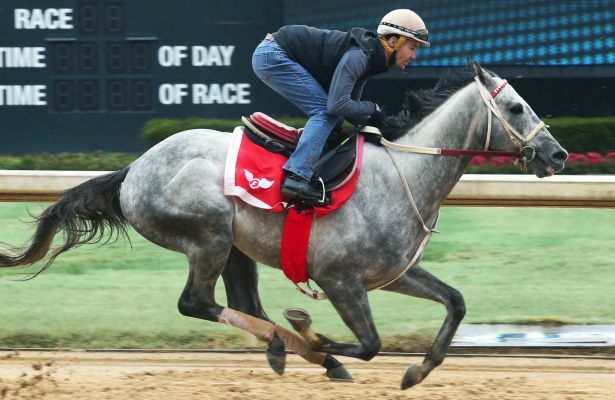 Several candidates for Oaklawn’s Presidents Day stakes tripleheader recorded workouts on a cloudy, damp Sunday morning, including Gray Attempt who breezed five furlongs in advance of the Grade 3, $500,000 Southwest Stakes for 3-year-olds Feb. 18. Working just after the renovation break from the five-furlong pole to the regular finish line, Gray Attempt went in 1:00.20 under Channing Hill and galloped out six furlongs in 1:12.60 over the muddy, sealed surface. The colt’s final quarter-mile was 23.60. The work was the first for Gray Attempt since a front-running neck victory in the $150,000 Smarty Jones Stakes Jan. 25, Oaklawn’s first of four major Kentucky Derby preps. The one-mile Smarty Jones, Gray Attempt’s first start around two turns, was his third consecutive victory. Long Range Toddy and Boldor, second and third, respectively, in the Smarty Jones worked for Hall of Fame trainer Steve Asmussen. Breezing together before the break, Long Range Toddy and Boldor covered five furlongs in 1:00.20. Zia Park Derby winner Nanoosh breezed five furlongs in 1:00.40 for trainer Robertino Diodoro. Tiz He the One covered a half-mile in 52.40 for trainer Jeremiah Englehart. Tiz He the One will put his near-perfect dirt record on the line in the Razorback, which will mark the stakes and seasonal debut for the 5-year-old Tiz Wonderful gelding. Tiz He the One closed his 2018 campaign with three consecutive one-mile allowance victories at Laurel and has been beaten only once in five career dirt starts. Tiz He the One arrived at Oaklawn about a week ago and tuned up for the 1 1/16-mile Razorback with a half-mile workout Sunday morning. Englehart chose the Razorback over next Saturday’s $250,000 General George Stakes (G3) at Laurel and said the $9 million Pegasus World Cup Invitational (G1) Jan. 26 at Gulfstream Park also factored into next-out plans. Englehart said Trevor McCarthy (3-for-3 on the gelding) would have the mount for the Razorback. Tiz He the One, who has a 4-0-1 mark from eight lifetime starts and earnings of $106,834, races for Lady Sheila Stable and Iris Smith Stable. Finish Lines: Allen Milligan, Oaklawn’s leading trainer in 2009, had 999 career North American victories through Saturday, according to Equibase, racing’s official data gathering organization. He had three horses entered Sunday at Oaklawn. … Warrior’s Club worked a half-mile in 48.60 Sunday morning for Hall of Fame trainer D. Wayne Lukas, who said he’s targeting a March return for the Grade 3 winner. … Multiple Oaklawn stakes winner Racer recorded a 3-furlong bullet work in 36 flat Sunday morning for trainer Jinks Fires of Hot Springs. Racer is scheduled to make his 2019 debut in Thursday’s fourth race. … Flawless Moon, an unstarted 3-year-old half-brother to Grade 1 winner The Big Beast, worked five furlongs in 1:00.80 Sunday morning for trainer David Fawkes. Also working Sunday morning was Hidden Ruler, an unstarted 3-year-old Gemologist colt who went a half-mile out of the gate in 48.20 for trainer Dallas Stewart. … Through Saturday, the ninth day of the scheduled 57-day meeting, 90 claims had totaled $1,299,000.